Parenting is the process of rearing children by promoting and supporting their physical, emotional, social, intellectual, moral and spiritual development from infancy to adulthood. This is usually done in a child's family by the mother and father (the biological parents). Where parents are unable or unwilling to provide this care, the responsibility may be taken on by close relatives, such as older siblings, aunts and uncles, or grandparents. In other cases, children may be cared for by adoptive parents, foster parents, godparents, or in institutions (such as group homes or orphanages). The relationships in the family form the basis for how children perceive themselves and the greater world. The family is the place where the individual learns the meaning of life, develops one's “whole personality,” as well as develops physically, psychologically, emotionally, and spiritually, through each of the relationships existing in the family. The parents' role in a child's healthy development cannot be overstated. The word parenting has drawn popular attention due to the necessity to clarify the process of upbringing a child at home by parents as distinctly different from the formal education of a child's teacher-student relationship at school. A parent's methods of educating a child are different than a teacher's. At school, teachers give a child general literacy and scientific knowledge; at home, parents give a child general wisdom of life as parents themselves understand it. The term "parenting" is a derivative of the word "parent," taken as a verb. When people say "to parent" a child it means "to be a parent," or "to fulfill parental duties." Generally, the majority of parents admit that those duties are to provide for the basic needs of a child—the child's need for security and development. This implies security and development of a child's body, mind, and soul. In other words, it is physical, intellectual, emotional, and spiritual security and development. Parenting is usually done in a child's family by the mother and father (the biological parents). When parents are unable or unwilling to provide this care, it is may be undertaken by close relatives, such as older siblings, aunts and uncles, or grandparents. In other cases, children may be cared for by adoptive parents, foster parents, godparents, or in institutions such as group homes or orphanages. There are also circumstances, such as on a kibbutz, where parenting is an occupation even when biological parents are close at hand. Parents patria refers to the public policy power of the state to usurp the rights of the natural parent, legal guardian, or informal caregiver, and to act as the parent of any child or individual who is in need of protection (such as if the child's caregiver is exceedingly violent or dangerous). 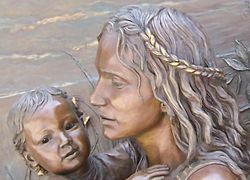 Faces of mother and child; detail of sculpture at Soldier Field, Chicago, Illinois, U.S. 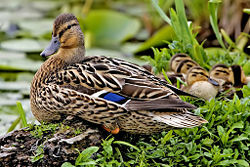 Female mallard duck and ducklings. A mother is the natural or social female parent of an offspring. In the case of a mammal, including a human being, the mother gestates her child (called first an embryo, then a fetus) in the womb from conception until the fetus is sufficiently well-developed to be born. The mother then goes into labor and gives birth. Once the child is born, the mother produces milk, a process called lactation, to feed the child. In non-mammals, such as birds, the mother lays eggs. The eggs may then be taken care of by either parent, or by both in rotation, sitting on them to keep them warm for a considerable time period prior to their hatching, at which point one or both feeds the chicks (often by regurgitation) until they are old enough to leave the nest. Even then, the young may follow the mother (or both parents) for a considerable time, for protection and to learn survival skills. Human mothers typically have a very important role in raising children. It is standard practice in industrialized countries that a mother receive prenatal or "ante-natal care" during her pregnancy to assist her in the various issues that may arise. The title "mother" can be given to a woman other than a biological parent who fills this role. This is most commonly either an adoptive mother or a stepmother (the biologically unrelated wife of a child's father). The term "mother" can also refer to a person with stereotypical traits of a mother, such as nurturing and other-centeredness. In some societies, single motherhood, the state of being an unmarried mother, is treated as a serious social issue. A Father is traditionally the male parent of a child. Like mothers, fathers may be categorized according to their biological, social or legal relationship with the child. Historically, the biological relationship paternity has been determinative of fatherhood. However, proof of paternity has been intrinsically problematic and so social rules, such as marriage, often determined who would be regarded as a father of the child. This method of the determination of fatherhood has persisted since Roman times in the famous sentence: Mater semper certa; pater est quem nuptiae demonstrant ("Mother is always certain; the father is whom the marriage shows"). The historical approach has been destabilized with the recent emergence of accurate scientific testing, particularly DNA testing. As a result, the law on fatherhood has undergone changes. Many of the world scriptures describe the Ultimate Being, the Creator of the World, God, as a parent. Hinduism compares the relationship between human beings and God to that of a father educating his sons: "God! Give us wisdom as a father gives to his sons. Guide us, O Much-invoked, in this path. May we live in light (Rig Veda 7.32.26)." The Jewish and Christian scriptures call God humanity's Heavenly Father. Examples include: "Our Father who art in heaven, hallowed be thy name (Matthew 6.9)." As well as, "You are the children of the Lord your God" (Deuteronomy 14.1). In the Lotus Sutra, the Buddha is called Father of the World. I tell you, Shariputra, I, too, am like this, Being the Most Venerable among many saints, The Father of the World … I tell you, Shariputra, You men are all my children, And I am your Father. For age upon age, you have been scorched by multitudinous woes, and I have saved you all (Lotus Sutra, 3). Similar statements are found in Islam, in the Vedas, and the Confucian classics. Anas and Abdullah reported God's Messenger as saying, "All [human] creatures are God's children, and those dearest to God are those who treat His children kindly" (Hadith of Baihaqi). In many religious traditions Ultimate Reality is also recognized to be humanity's divine Mother: "I am Father and Mother of the world" (Bhagavad Gita 9.17). Often God's Fatherhood and Motherhood are identified with Heaven and Earth, which cooperate in the creation and nurturing of humankind and the universe. There are sacred scriptures descriptions of God's love in terms that can be said to encompass both fatherly love—Creator, Teacher, Guide, and Savior—and motherly love—Nurturer, Fount of compassion, and Sustainer. The family's efficacy for personal growth is such that some religious traditions equate honorable and loving relationships in the family with a template for a person’s right relationship with God. In the Talmud, for instance, it is written, "When a man honors his father and mother, God says, 'I regard it as though I had dwelt among them and they had honored me'" (Kiddushin 30b). Confucius said, “Surely proper behavior toward parents and elder brothers is the trunk of goodness” (Analects 1.2). Jesus encouraged his disciples to relate to God as a loving father, calling him "Abba." A parent's primary responsibility is to provide physical security and ensure their child's safety. Parents provide physical safety: Shelter, clothes, and nourishment; they protect their child from dangers; and care for a child's physical health and well-being. Developing a child physically refers to providing the conditions that lead to the healthy growth of a child, such as training the body of a child through sport and physical games; assisting the child to develop habits of health; and to maintain regular medical well-child examinations. Intellectual security refers to the conditions, in which a child's mind can develop. If the child's dignity is respected, and the child feels physically and emotionally safe, then he is able to learn. The parent is responsible to provide an atmosphere of peace and justice in the family, where no one's dignity is encroached upon. The ideal environment is a nurturing one, free from fear, threat, and verbal abuse. Most parents educate their children within their own religious faith, spiritual traditions, beliefs and cultural norms, ethics, and value systems. Every child may be regarded as sacred, containing "the spark of celestial fire called conscience." Obedience to parents can only be founded upon trust in parents, won by their unflagging devotion to the child's best interests. As a result, gratitude, empathy, and a high ethical standard will later develop. In order for children to be able to accept their parents' standards, they must feel genuinely loved and accepted by them. Parents must make sure that a child feels unconditionally loved. To provide emotional security to a child means to secure his or her soul. It is to provide a safe loving environment, giving a child a sense of being loved, being needed and welcomed through emotional support, encouragement, attachment, caressing, hugging, and so forth. Parents nurture their child's emotional development by providing opportunities for play and social activity. Teaching a child to organize parties for other people, play with younger siblings, etc. Parents are also responsible for financial support of their children. They may provide this directly on a daily basis, or the non-custodial parent may give money to the guardian in the form of child support. Beyond payment of essentials, such as food, clothing, and shelter parents are also responsible to pay for their children's healthcare and education. Parents are legally responsible for medical and legal decisions regarding their children's welfare. They may also be held liable for wrongdoings carried out by their children when they are too young to take legal responsibility themselves. During pregnancy the unborn child is affected by many decisions his or her parents make, particularly choices linked to their lifestyle. The health and diet decisions of the mother can have either a positive or negative impact on the child. Many people believe that parenting begins with birth, but the mother begins raising and nurturing a child well before birth. Scientific evidence indicates that from the fifth month on, the unborn baby is able to hear sound, is aware of motion, and possibly exhibits short-term memory. There is evidence that the unborn baby can become familiar with his or her parents' voices. Research has also indicated that by the seventh month, external schedule cues influence the unborn baby's sleep habits. Being the parent of an infant is a major responsibility. Infants require continuous care, including (but not limited to) feeding, bathing, changing diapers, and health care. At this stage of life, the child is in the position to receive from their caregiver; they are helpless without the loving concern of adults. Infants, especially, need to receive unconditional love from their parents. Parenting responsibilities for preschool age children often include (but are not limited to) feeding, bathing, toilet training, ensuring their safety, and attending to their well being. Parents are expected to make decisions about childcare and preschool education. At this age, children begin to relate to peers, usually beginning with their siblings. If they have no siblings, parents may find opportunities for them to have interactions with other children with good adult supervision, such as trusted daycare or preschool, play dates with children of neighbors, extended family, or friends. These important relationships with siblings and peers are training for life. Sibling rivalry often arises, and parents are key in maintaining harmony by affirming their love for all their children. Parenting responsibilities during the school years include (but are not limited to) feeding, assisting with education, ensuring their safety and wellness, and providing them with a loving and nurturing home environment. In particular educational issues become significant as the child moves from Kindergarten, through Primary education, and Middle school levels of education. In this age group, peer relationships, whether friendship, rivalry, or conflict, become a greater importance to the child. When parents have laid a strong foundation of parental love, and children have responded with filial love, they are better able to develop harmonious relationships with their peers, and to find strength in their family to weather the storms of disappointments and difficulty in less successful social situations. During adolescence children are beginning to form their own identity and are testing and developing the interpersonal and occupational roles that they will assume as adults. As they navigate high school and begin to enter the world of work, adolescents look to peers and adults outside of the family for guidance and models for how to behave. Nevertheless, parents remain influential in their development. Parents should make efforts to be aware of their adolescent’s activities, provide guidance, direction, and consultation. Adolescence can be a time of high risk for children, where newfound freedoms can result in decisions that drastically open up or close off life opportunities. A quality relationship between parent and child is a significant determinant of the behavioral health of children. Daily interactions with parents have been found to significantly reduce the risk of depression, suicide, promiscuity, substance abuse, and school absenteeism. Teens who feel they have a quality relationship with their parents are less likely to engage in risky behaviors. Even children who experience crippling social events can still lead healthy, well balanced lives. Such resilience and restoration of health has been attributed to the presence of an adult who offered personal care and guidance. With that the child’s self esteem and sense of place was reestablished. From there, the child could navigate the world. It is becoming more common for young adults to remain in their parent's home longer than in previous generations, and for many to return home after living independently for a period of time. It is important for parents to not see their adult children as "children" but to relate to them as adults, yet at the same time to discuss openly issues such as finances, household chores, appropriate behavior, and so forth. Honest communication and negotiation may be necessary. Especially when there is a supportive environment, young adults are more likely to remain at home or return home. In many cultures of the world, it is quite common for three generations to live together. During this time, the young person makes career and other choices: They may attend college or other training, begin a career with significant work-related responsibilities, or enter into a romantic relationship, possibly marriage. The experiences a young person has had in their own family, receiving love from their parents, relating to their siblings, and observing their parents' marital relationship, all play significant roles in determining how a child will relate to his or her own spouse and children. Parenting does not end when a child leaves home and lives independently. A parent is a parent forever, even though eventually roles may be reversed as adult children care for their elderly parents. Parenting typically utilizes rewards, praise, and discipline or punishment as tools of behavioral control. Most child development experts now agree that corporal punishment is not an effective behavior modification tool, and many parents have adopted non-physical approaches to child discipline. In some jurisdictions, corporal punishment (spanking or whipping) has been prohibited by law. Four main parenting styles have been identified in early child development research: Authoritative, authoritarian, permissive, and neglectful. Authoritative parenting is characterized by high expectations of compliance to parental rules and directions, an open dialog about those rules and behaviors, and is a child-centered approach characterized by a warm, positive affect. 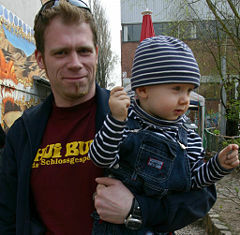 Authoritarian parenting is characterized by high expectations of compliance to parental rules and directions, the use of more coercive techniques to gain compliance, little parent-child dialog. This is a parent-centered approach characterized by cold affect. Permissive parenting is characterized as having few behavioral expectations for the child, and is a child-centered approach characterized by warm affect. Neglectful parenting is similar to permissive parenting but is a parent-centered approach characterized by cold affect. Outcomes associated with each type of parenting has traditionally shown a strong benefit to authoritative parenting. These children have been shown to have more self-discipline, emotional self-control, more friends, and better school performance. However, recent research has identified a number of caveats. For example, authoritarian parenting may be more effective in certain contexts and in social groups other than those studied in early research. Most significantly, parenting has been shown to be part of a bi-directional relationship between parent and child. Thus, characterizing a parenting style as arising from the parent leaves out the essential influence of the child on the parent-child dynamic. There have been many efforts to develop understanding of parenting, and to develop tools and educational programs to assist parents in better raising their children. Some examples follow. The nurturing parent model envisions a family model where children are expected to explore their surroundings with protection from their parents. This model is based on the assumption that children inherently know what they need and should be allowed to explore. Parents are responsible for protecting their child during this exploration, including protecting their child from themselves by offering guidance. A child should be picked up if the child cries because the parent wants the child to feel safe and nurtured. A child who grows up believing that its needs will be met will be more confident when facing challenges. The strict father model of parenting is one which places strong value on discipline as a means to survive and thrive in a harsh world. So this model of child-rearing would involve allowing a child to cry themselves to sleep. Picking up a child when it should be sleeping might foster dependence on the parents and is not a display of discipline. In his book Dare to Discipline, James Dobson advocates the strict father model. However, researchers have linked authoritarian childrearing with children who withdraw, lack spontaneity, and have lesser evidence of conscience. Attachment parenting, a phrase coined by pediatrician William Sears, is a parenting philosophy based on the principles of the attachment theory in developmental psychology. According to attachment theory, a strong emotional bond with parents during childhood, also known as a secure attachment, is a precursor of secure, empathic relationships in adulthood. Attachment parenting describes a parenting approach inspired in part by attachment theory. Attachment theory, originally proposed by John Bowlby, states that the infant has a tendency to seek closeness to another person and feel secure when that person is present. In comparison, Sigmund Freud proposed that attachment was a consequence of the need to satisfy various drives. In attachment theory, children attach to their parents because they are social beings, not just because they need other people to satisfy drives and attachment is part of normal child development. Attachment parenting seeks to create strong emotional bonds and avoids physical punishment, with discipline being accomplished through interactions recognizing a child's emotional needs. The term "child training" implies a specific type of parenting that focuses on holistic understanding of the child. The "Taking Children Seriously" philosophy sees both praise and punishment as manipulative and harmful to children and advocates other methods to reach agreement with them. Discipline through "time-out" and parental supervision is encouraged. This approach regards as Love, Consistency, Structure, Motivation, and Accountability as fundamental to parenting. Attachment parents seek to understand the biological and psychological needs of the children, and to avoid unrealistic expectations of child behavior. In setting boundaries and limits that are appropriate to the age of the child, attachment parenting takes into account the physical and psychological stage of development that the child is currently experiencing. In this way, parents may seek to avoid the frustration that occurs when they expect things their child is not capable of doing. Attachment parenting holds that it is of vital importance to the child that to be able to communicate needs to adults and to have those needs promptly met. Life Coaching draws from the fields of psychology, counseling, social work, consulting, management, spirituality, and yet it is it’s own unique profession. The goal of coaching is to evoke excellence in others. The coaching model has been found to be especially effective in parenting adolescents. At this stage they are striving for independence, a natural developmental phase. This model encourages parents to switch gears from the “teaching” and “managing” role used during the younger years, to a coaching role. Coaching honors the independence and resourcefulness of the other, while at the same time provides support and evokes the best in the other. Coaching honors the uniqueness, creativity, and resourcefulness of each individual. Teens respond well to this approach, as they long to feel heard and understood—two key elements in coaching. The Parent as Coach model teaches parents problem-solving skills, as well as ways for parents to support their children in decision making and facing challenges. The Parent as Coach Materials provides practical solutions for parents to improve and strengthen their relationships with their children. Christian parenting is popular amongst Evangelicals and fundamentalist Christian parents who see it as applying biblical principles to parenting. Information on Christian parenting may be found in publications, Christian Parenting websites, and in seminars devoted to assisting parents to apply Christian principles to parenting. Particularly influential has been James Dobson and his guide, Dare to Discipline. While some Christian parenting models are strict and authoritarian, others are "grace-based" and share methods advocated in attachment parenting and positive parenting theories. ↑ I. Epstein, The Babylonian Talmud (New York: Soncino Press, 1948). ↑ Arthur Waley, The Analects of Confucius (New York: Random House, 1938). ↑ Howard Gardner, Frames of Mind: The Theory of Multiple Intelligences. ↑ George Washington, Rules of Civility in Conversation Among Men, in The Book of Virtues, edited by William J. Bennet (New York: Simon and Schuster, 1993, ISBN 978-0684835778). ↑ Ross Campbell, How to Really Love Your Child (Victor Books, 1977, ISBN 978-0781439121). ↑ Betsy and Farley Jones, Children of Peace (Holy Spirit Association, 1997, ISBN 0910621845). ↑ www.cpc.unc.edu, National Longitudinal Study of Adolescent Health. Retrieved February 15, 2017. ↑ Diana Baumrind, Parental disciplinary patterns and social competence in children. Youth and Society, 9(1978): 238-276. ↑ E. E. Maccoby & J. A. Martin, "Socialization in the context of the family: Parent-child interaction." ↑ Diana Haskins, Parent as Coach (Portland, OR: White Oak Publishing, 2001, ISBN 978-1883697778). ↑ Families Online Magazine, Hompeage. Retrieved February 15, 2017. ↑ James Dobson, Dare to Discipline (Bantam, 1982, ISBN 978-0553255287). Baumrind, Diana. "Parental disciplinary patterns and social competence in children." Youth and Society. 9(3)(1978): 238-276. Bavolek, S.J. Handbook for the Adult-Adolescent Parenting Inventory. Eau Claire, WI: Family Development Associates, Inc., 1984. Clarke-Stewart, A.K., F.A. Goosens, and V.D. Allhusen. "Measuring infant-mother attachment: Is the Strange situation enough?" Social Development. 10(2001): p143-169. Epstein, Isadore. The Babylonian Talmud. New York, NY: Soncino Press, 1948. Holigrocki, R.J., P.L. Kaminski, and S.H. Frieswyk. Introduction to the Parent-Child Interaction Assessment. Bulletin of the Menninger Clinic. 63 (3)(1999): 413-428. What is Attachment Parenting? by Jan Hunt, The Natural Child Project. The temperamentalist Interview with Jerome Kagan by Christopher Shea, The Boston Globe, August 29 2004. This page was last modified on 15 January 2019, at 16:43.